So today I was flying to Miami, yes I know I said I wasn't going anywhere but an emergency came up and I had to fly down for the night. Usually I try and get to the gate about 10 minutes before the plane boards and spend the rest of the time searching for a Starbucks in the airport to get my fix before the flight. As I was walking past the gate that my plane was leaving from, about an hour before boarding and before the plane was even at the gate, I looked over and saw this guy. I will bet you $20 that you can't walk past a gate and see one of these guys standing at the line to board the plane hours before the planes even boards. I would even venture that the majority of people you see doing this look just like this guy and have a cell phone crammed in their ear. It mystifies me why anyone would do this. 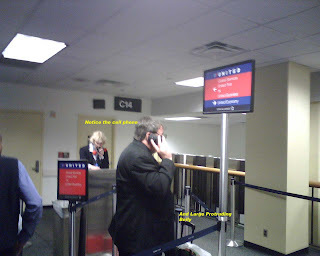 First lets point out that this person is a premier executive or 1K flyer with United because he is waiting on the red carpet line, meaning this guy is going to board first anyhow. The airlines have gone through great trouble to assign seats, put zones on your board pass so that you don't have to stand in line for 2 hours before the plane takes off. Now if your elite with United you board first anyhow, I usually board at this time, and I don't understand the big advantage to being the first one on the plane or the tenth, I mean after all there are 200 seats on the plane, I don't think they are going to run out of room (of course they might if they are all as big as this dude). None the less, there they are, the line standers, as if they were waiting to get tickets to Dave Matthews as opposed to boarding a stupid plane. Even if your sitting in first class and boarding first, there will be some moron standing in line 2 hours before the plane takes off.... your in first class...relax for god sakes. Anyhow this is another installment of silly people at the airport. Someone needs to pass out yoga tapes at the gate to the line standers, they will live longer.